Dog Severely Burned - Justice for Zeus! 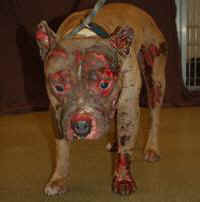 Today, the person who had pled guilty to one count of felony animal abuse and one count of felony knowingly burning in the case of Zeus, a male pit bull who suffered severe burns, has been sentenced to four years in the Missouri Department of Corrections. During the proceeding, the judge stated these crimes were compassionless acts. "Today serves as a victory for all animals suffering from abuse and neglect," said Kathy Warnick, president, Humane Society of Missouri. "The Humane Society of Missouri applauds the court’s decision to sentence the perpetrator in this heinous case."